Last year brought major changes for me, both in my work and my interests. ScaleSailing had to take a back seat while my new business partner and I launched our T-shirt design business, “odd guy art.” We have great plans for that business, and it will continue to take much of my working time. Also, some of you may know that family health matters complicated the latter half of the year. Thankfully, that worked out well in the end. So, I have chosen to get ScaleSailing back in the water, as it were, by seriously streamlining the business. I intend to concentrate solely on the production of the Kittiwake K2 and OPUS rig/sail kits. A few of my custom accessories will be available, too, but I will no longer sell servos. Check out the products page at ScaleSailing.com for the new line up. 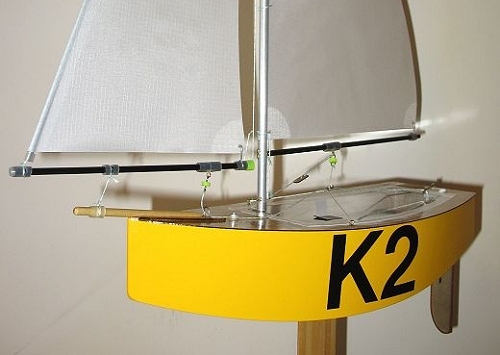 The Kittiwake K2 will be supplied as the same craftsman quality (yet easy-to-build) kit as before. With the comprehensive step-by-step building instructions and the extensive CD of building photographs, K2 is regarded as one of the best kits on the market. The kit builds a beautiful, fine-sailing wooden boat. Two years of increasing production costs and smaller production runs mean that I will no longer try to compete with the cheap (mass produced) kits on the market. However, ScaleSailing kits will still be produced with the same care and love that I always applied in the past and I truly hope that you will still find them to be great value for your money. The first OPUS Rig (TM) kits are shipping out of the footy boat yard today. During next week I will be filling the rest of your pre-production orders and building up inventory so I have rig kits ready to go in quick order. The weather has been a little milder here of late, above freezing in fact. So with any luck the water will be turning soft earlier this year than the last two years. When that happens, I am looking forward to doing more trials with the OPUS Rig on other hulls, especially the K2 as I have had a number of questions about that already. I am very keen to hear feedback from OPUS Rig users as to what hulls they are using it with and suggestions of mast socket positions. I will add such suggestions to the building and tuning instructions for the rig. Six OPUS rig boom assemblies ready to go. During this week and next I will be completing the initial batch of OPUS rig kits and filling my pre-production orders. These 6 are part of the initial batch of 24 rigs. 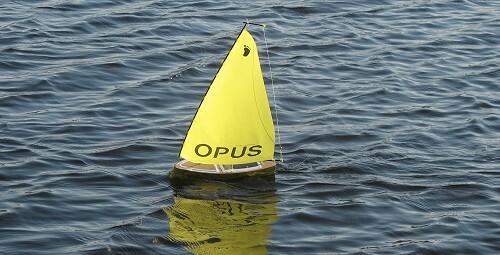 OPUS rigs will have an attractive yellow sail as standard with white as a special order option. The sails will be plain yellow without the large OPUS logo in case you might be wondering about that. You can add the footy logo using our template available seperately if you wish or just freehand it! The extruded carbon mast socket tube (3mm internal) is included in the kit, the rig simply drops into the tube. Switching OPUS rigs is quick and easy requiring just the main sheet to be unclipped (the sail control thread) then you lift out the whole rig as one. All sail tuning will therefore remain intact as you store the complete rig as one piece. Switching rigs doesn’t get any easier. Extra carbon mast socket tubes will be available so you can order a set of 3 to go with a rig if you are experimenting or want extra rig positions to help in tuning your footy. To kick off 2010 we have the new OPUS rig kit available now as pre-production kits. Meaning that I do not have stock on the shelves yet but any orders I receive will be filled in received order as I complete the initial kits, finish the instruction sets etc. These will be the same as full production kits it’s just that you will not get them quite so quickly. 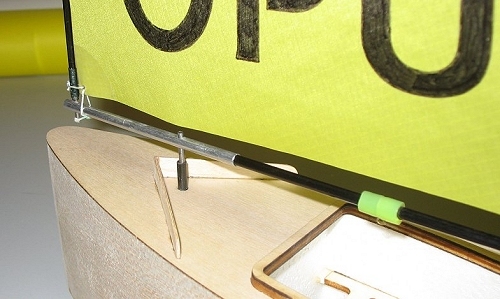 The OPUS rig available initially has 140 sq.in. of area and is a good sized ‘working rig’ for average conditions from light winds up to a good blow. There will be full written instructions (working on that now) to our usual step-by-step standard plus a whole new section on the ScaleSailing Photo CD which will cover all assembly plus a ‘how to tune your OPUS rig’ section which we hope you will find very useful. The OPUS rig will suit many of the footy designs on the market with the addition of the mast pivot tube included in the rig kit. 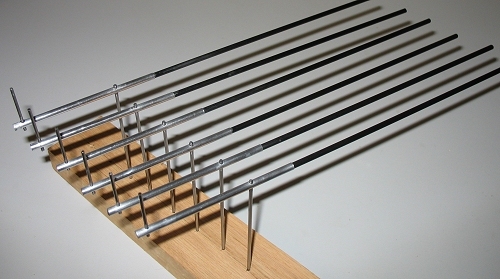 A little experimentation will be required initially to find the correct position, maybe add a set of three mast tubes to allow experimentation. Once a database of converted designs is collated (with your help thank you) then that information will become available too. Copyright 2010 by Graham McAllister Designs. OPUS is a trade mark of Graham McAllister Designs. I have a major virus, or adware attack, I don’t know which because it has disabled all of my scanning software. I am gradually salvaging information and transferring it to a new desktop and my laptop. I have however lost many emails so there may be some of you who read this who have not had a reply etc. from me in the last two weeks. If so please accept my appologies and contact me again at my scalesailing@sbcglobal.net address only please. Well it’s been a lovely summer so far here in sunny Sheboygan, Wisconsin. The lakefront is looking beautiful and the lake itself is sparkling daily. My walks along the river have never been more fun and the Opti’s dancing in the harbour more delightful. The coffee tastes great, the music lively, the arts scene busy and the company is entertaining. So this is where I have been, choosing life! The Kittiwake business is not being neglected though, sales have been good this summer and enough to keep me busy with those rather than any new additions to the fleet. A batch went to Canada for a youth construction project which I hope is going well. I had the first Kittiwake K2 go to the Czech Republic a few weeks ago and a batch of three will be leaving for Japan this week. Supplies have been challenging though, my usual source for carbon extruded tubing has been very slow fulfilling a current order. This is not impacting the K2 kits but it has stopped me being able to start production of the OPUS rigs just yet. Hopefully this will be resolved soon, no doubt there is a huge shipment on it’s way across an ocean somewhere. Dragon continues to sail well and will be having one change before the final production version, a larger rudder. I have come to the conclusion that the una rig is a little more reluctant to tack than a sloop rig as on the K2 and a more powerful rudder will bring it back to the snappy tacking I think these footys need. Other news is that the 3x cell battery boxes with integral receiver switch are selling very well. It’s a nice simple solution, I convert the boxes with a servo lead so that they plug directly in to your receiver without a seperate switch harness. Three of the Lithium Energiser dry batteries give plenty of voltage (they are marked as 1.5v but give more like 1.75v even under load) for operating a footy. I have been using the 3xAAA box in the Dragon prototype and it just seems to keep on going and going! Other other news, my daughter in England just bought her first house so I’m ‘chuffed to bits’ for her about that. So I’m told I need a plane ticket to go and help with the painting and decorating. Cheap accomodation, I can camp out on the job 🙂 . My MGB engine work has just been completed so I’m looking forward to getting my hands back of that and starting assembly intead of stripping things apart. That looks like an over winter rebuild now but I’m determined to have it ready for the spring. Of course my daily runner Ford, isn’t, running that is. But it’s a Ford right, pity it’s only a 4 cylinder or I could get it ‘clunked’!